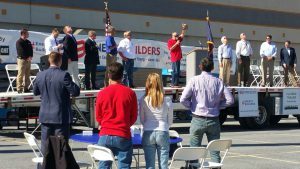 Energy Builders and local business Cleveland Brothers hosted four hundred construction and equipment supply chain professionals who build pipelines and other critical energy projects at a rally on October 19, 2017. Energy Builders members rallied to tell Pennsylvanians why expanding clean, safe energy infrastructure is vital to the prosperity of Pennsylvania’s families and future. The rally’s speakers urged Pennsylvania lawmakers to speed approval of energy infrastructure construction permits, support natural gas production, and oppose the natural gas severance tax currently being debated in the state legislature.